Learn more interesting facts about wine! The sugar content in wine varies from wine to wine, depending on a number of factors. Keep reading for some general guidelines on how these, and other factors, affect the sugar content in different types of wine. Grapes contain sugar and yeast. In some cases, yeast is added to the grape juice to aid in fermentation. As yeast begins to react with the sugar in the grape juice, the sugar is converted to alcohol and carbon dioxide. Once the alcohol levels are high enough in the wine, the alcohol then kills the yeast and any remaining sugar that hasn't converted into alcohol becomes the wine's residual sugar content. The sugar content in wine is usually a measure of residual sugars left behind during the fermentation process. In most cases, wine does not have sugar added to it - although there are a few exceptions where flavored wines have sugar added. The residual sugars in wine are those sugars that don't convert to alcohol and carbon dioxide as part of the wine's fermentation process. In general, the residual sugar content after fermentation is inversely proportionate to the alcohol level. This means that higher alcohol wines have less sugar and lower alcohol wines have more sugar. For instance, a higher alcohol wine like zinfandel has less sugar than a lower alcohol wine like a Riesling. The exception to this sugar/alcohol ratio are fortified wines, such as port, which have more alcohol added in after fermentation is complete. The measure of residual sugar in wine is often referred to as Brix. Very sweet, high sugar wines are often palatable because they are balanced by acidity. A wine that is said to be a dry wine has less sweetness. Semi-dry wines are slightly sweeter. Semi-sweet wines are sweeter, yet, and dessert (or sweet) wines are the sweetest of all. 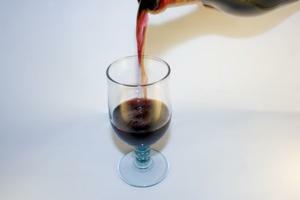 There are a number of factors that affect the final amount of sugar that winds up in wine. First and foremost is the sugar content of the grape. Some grapes are naturally higher in sugar than others. Muscat grapes, for instance, are a fairly high sugar grape while chardonnay grapes are a low sugar grape. Another factor that affects how much sugar the wine ends up with is how late in the season the grapes are harvested. The longer the grapes stay on the vine, the more concentrated the sugars become. This process is very evident in the classification of German Riesling wines, which are harvested at different times during the season. The later the harvest, the higher the sugar is in the grapes - and ultimately the wine. German winemakers classify their wines according to sweetness. Classifications range from the early harvest Kabinett wines with lower sugar content to Eisweins, a very sweet dessert wine. Winemakers harvest Eiswein grapes after frost has set into the region. German winemakers also harvest Trockenbeerenauslese (TBA), also a sweet wine, late in the season in years where there is not an early frost..
Vintners measure residual sugar in wine in grams per liter. The abbreviation for this is g/L. Most wines - even the driest of wines - have at least one gram per liter of residual sugars after fermentation. Sweet wines have anywhere from 45 grams per liter to 150 grams per liter or even more. For instance, the gold standard of sweet wines, a Chateau d'Yquem Sauternes typically has between 100 and 150 grams per liter. Red wines and dry whites measure in the low ranges of grams per liter - coming in around one or two grams per liter. In recent years, however, more wineries have been making sweet red wines that have sugar content similar to sweet whites and dessert wines. These are just a few of the principles that guide the wine's sugar content. Most wine sellers and wine makers can direct you towards a wine that has just the right amount of sweetness for your palate.